At the beginning of this year I delved into bramaking for the first time, and even though I’ve been sewing since I was young, and actually design and make clothes for a living, that experience counted for little when it came to making a bra! Let’s just say that the quick-unpick remains my best investment ever. 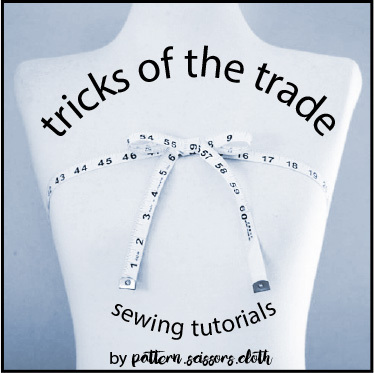 To save you some of the pain of unpicking those tiny zig-zag stitches multiple times, I thought I’d share some of the things I learnt along the way – big, small, obvious and not-so-obvious – so you don’t have to waste the amount of time I did! Get to know all the different zig-zag stitches you will be using and practise on a remnant before you start. Note down your favoured stitch length and width, or use your sewing machines memory to do so. As you will be switching back and forth between different stitches often, this ensures your results are consistent. Guess who didn’t do this but wishes they did?! I didn’t realise this before, but underwire channelling curves naturally one way and not the other, so you need to make sure it corresponds with the curve of the underwire. The uppermost channelling is a lot happier – don’t you think? It is not immediately obvious, and was only due to the sewing instructions in the Boylston Bra pattern that I realised this – thankfully I was following them! Planning is paramount. There are lots of bits and pieces in a bra and many individual components to source, not to mention the various different colours and sizes of each one – I needed to write a list to get my head around it all! Very important scribbles, at least I understand it! It is also handy to gather everything you need before you start. I had to stop mid-way in my project and order extra trims, and the wait was frustrating! With all those tiny frame and cup pieces, accuracy is really important. Normally I cut with gigantic tailors shears, but for cutting out a bra I found it useful to lay up the lace and lining together and cut them with a rotary cutter so they are exactly the same shape. This gorgeous silver grey lace is my next project, yet to be finalised! My rotary cutter is a bit tricky rolling smoothly around tight curves though, is a smaller one easier for this? Buy enough materials for two bras. Sorry to say this, but your first one may not fit! Even if you make a mock up, it is hard to gauge bra fit accurately until that final hook and eye is attached. However once you have accurately assessed the fit of your first attempt and made the necessary alterations, your second attempt will be spot on – and you’ll have the construction process nailed too! Halfway through my first bra, waiting for parts…! Bras are fantastic for using up remnants. You will never look at a scrap of lace or silk the same way again, as it could one day be useful in your new favourite hobby. The same thing goes for lingerie that is past its use-by date – the bows, underwires, hook and eye, rings and sliders suddenly switch from rubbish to reusable components. Start planning a bigger storage space now! Bra sizing is a little weird. There appears to be two different sizing systems that give two different results, and one makes far more sense to me than the other. Taking your measurement, rounding up to the nearest inch and then adding another 4-5″ doesn’t sound very accurate to me. Clearly I need to study this area further – or maybe it is me that is weird! I should have known this, but I did it anyway! Don’t forget undies! You’ll need a pair or two of matching underpants to team with your fancy new bra so it doesn’t become an orphan in your lingerie drawer. Remember to buy supplies for them at the same time so you don’t miss out that exclusive lace! I think it’s a good idea to make a couple of different styles (bikini, boy leg, high waisted…) so you have options for whatever outfit you are wearing. My tenth tip is actually a community warning to all sewing folk out there – bra making is addictive. I’ve made several lingerie sets already this year. I can’t look past a scrap of lace or satin and wonder if I could squeeze a bra out of it. I can’t wait until a certain favourite bra expires and I can steal the bow off it. I walk into lingerie stores and think: nah, I can make that 🙂 The rest of my wardrobe might be in tatters, but at least my lingerie drawer isn’t! If you have made it this far, you are obviously in the lingerie making club. If you are a seasoned bramaker, I guess you had a chuckle at some of my mistakes! Have you done the same things yourself? I’d love to hear your opinion on the various bra sizing methods too. And if you are a beginner, I hope I’ve saved you some time with your quick-unpick! And one last quick question – should I invest in a smaller rotary cutter? What size do you use? I have yet to make ny one bra, maybe doing do would mean I have one I would actually wear? I usually build shelf bras into my tees, and leave it at that. I don’t like the chest squeeze bras give me. Otoh, I have tried different sizes of rotary cutters. I will admit I am a “scissor snob” but even I agree rotary cutters are great for slippery fabrics. And the small ones are best for navigating tight curves. I have to say that my handmade bras are very comfortable, so if you find purchased ones uncomfortable maybe it is worth giving bramaking a try! I’m a scissor snob too, but rotary cutters are a useful tool. Bra sizing is weird — even weirder is trying to figure out what size wires to order. One place says one size, another place says another size … I rely on Bev Johnson and her Bra Makers Manual for most of my bra-making instruction. It was a pricey buy, but infinitely more helpful than pattern instruction sheets. Best of luck if your body falls between sizes. Those of us who measure 37 get to decide whether to alter a 36 up, or a 38 down. And cup sizing is what takes the most time to get right when you start out — you really do have to complete a bra to properly determine if the cup size is correct. Fortunately bras are fairly quick to assemble. And you can scavenge parts from old bras to use during the fitting stages. Yes to wires – I didn’t realise there were so many different shapes! The Bra Makers Manual sounds like a good investment, I might consider it. Yes! A smaller rotary blade is easier. That being said, once I get my adjustments done on the pattern, I am going to trace them onto oak tag, trace around them onto the fabric, then cut them so I don’t accidentally shave off any of the pattern piece. That was recommended somewhere I read…. your sets are gorgeous! I also wrote down my specific stitch lengths, makes it so much easier. The Cloth Habit way of measuring worked much better for me than Orange Lingerie and Bra Makers. Isn’t it wonderful that we have choices! I looks like I’ll have to invest in a smaller rotary cutter. It is tempting to cut directly around the pattern with one, but if you shave off small amounts each time you’ll soon end up with a smaller cup size!! I have not made a bra – and to be honest I doubt I ever will. I’m fascinated by stories of people who have and do though like yours 😉 It’s an intriguing notion but I think a bit fussy and I have a feeling it would be daunting for me (I’m a 36FF and I’m 62 years old just to give you an idea 🙂 ) I love my smaller rotary cutter by KAI by the way. I reach for it all the time. That is what I thought about a year ago. But, I can now say that self-made bras are great for that particular size range : ). It’s like custom made underpants also – the personalized fitting eliminated all those little annoyances that I didn’t even realize I had. Ditto on the smaller cutter. Yes get the smaller size rotary cutter. I use 2 sizes when cutting bras. The large for straight cuts and the small for the curves. It looks like I’ll have to invest in one for my new hobby! Still haven’t made an underwired bra. I’m tempted but after having been fitted and finally found a bra that fits I am not sure I want to try fiddling with a new pattern…maybe I should copy my bra? I’ve gotten addicted to swimwear though! As others suggested, I would get a small (I have a 28 size) cutter. it’s very handy for those small curves not to mention slippery fabrics! I haven’t tried swimwear yet, but I can see that changing soon! I generally fit store bought bras, but what attracts me to lingerie is all the intricate details – I love the fiddly stuff! I’ll be a voice of dissent here on the small rotary cutter question. I bought one when I started making bras because I saw so many people going on & on about how it was so much more precise on tight curves & fiddly fabrics. But I hated it. I found it so much more tempermental than my 45mm rotary cutter. Maybe it’s just that I am so accustomed to the larger one, the smaller one feels weird in my hand? I used the small one for exactly one bra & then went back to the big one & haven’t had any problems with precision cutting or anything. I find it hard cutting the inner curve of the bridge smoothly with my cutter. I’m on the lookout for a smaller one at the moment – it will be interesting to compare the difference! I love to sew almost anything but the idea of sewing bras just has no appeal – it is so easy to buy them and not spend so much time on an item that doesn’t show 🙂 that said the ones you have made are so lovely. Isn’t that interesting? Others have said they have no interest too, it must be a sewing personality thing! I fit ready to wear bras fine, so it’s not that that makes me interesting in sewing them. I think it is the intricacy and details that I like, plus I just love lingerie design in general! I want to start making my own bras, and have been checking all the different websites related to bra-making. You pointed out some things that I had not seen so far, so thank you! When I take the plunge, I will be much better prepared. Good luck with your new hobby – as I warned, it’s addictive! Great post, thanks! I have three wearable bras, all from the Shelly pattern. My 28mm Olfa is a dream cutter for those fiddly bits. I really, really, want to try a new pattern, just for something new but it’s the sizing/fitting that holds me back. The right fit seems to depend on many factors including the fabric used for the bra itself. I also find that it’s helpful to already have a well fitting bra in order to get an accurate size. The fitting can be a bit off-putting! It will be worth the time investment though, as you can make several bras from the same pattern and still make them look different. Although as you mentioned the fabrics can affect the fit especially if they stretch different amounts. My jade lace was stretchier than the midnight lace, but I lined both cups in sheer cup lining so they are a very similar fit. Ooh thanks for that tip! I haven’t tried spray adhesive, and to be honest the idea of using glue on fabric didn’t appeal to me – but so many people seem to recommend it that I must give it a try! I keep collecting the notions and fabric scraps for the bras but so far only a Watson but an underwire bra is my everyday bra. Thank you for the tips and also BEATA that is a brilliant tip. I’m a scissor fan too. My rotary cutter was bought to cut out a quilt (that I still haven’t finished…! ), but it has come in very handy for lingerie making! I have never made any underwear and not sure I will but your pieces look amazing and your tips are always very handy. Yes, I am learning fast how ‘not’ to do things! I will conquer bra sizing one day, and I’m sure that beautiful thing from your bra making class too!